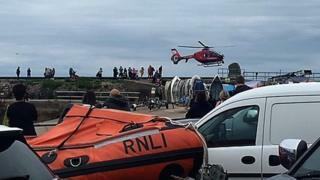 A crash between two boats at a regatta in Devon left one person seriously injured. A crew member onboard one of the vessels was airlifted to hospital with a serious leg injury following the collision on Sunday at the Brixham Heritage Regatta, the RNLI said. Two lifeboats were deployed and two people onboard the other boat were reportedly treated for shock. The RNLI described the incident as "serious". The event, which involves several races for traditional sailing boats, has been held annually in Torbay since 1997, but has its roots in trawler races dating back to the 1800's. Sunday's event was part of the busy Brixfest celebrations in the port. An RNLI spokesperson said: "Two vessels taking part - Ivory Gull and Moya - had collided, resulting in a serious injury to one casualty aboard the Ivory Gull." "The incident took place 1.5 miles out in Torbay, and HM Coastguard teams were also in attendance, along with Devon Ambulance Service," they added.